Ukrainian League 2017/18. 5th round. August 12, 2017. Oleksandriia. KSK Nika. Att. : 3,816. +29 oC. Paulo Fonseca made only one substitution in the starting XI compared to the previous encounter with Mariupol (3-1): Viktor Kovalenko replaced Taison to drop behind a forward. As early as inside the fourth minute, the Donetsk team could break the deadlock. Viktor Kovalenko put Facundo Ferreyra through to a shooting position, before the goalkeeper was forced to make a save for the hosts. 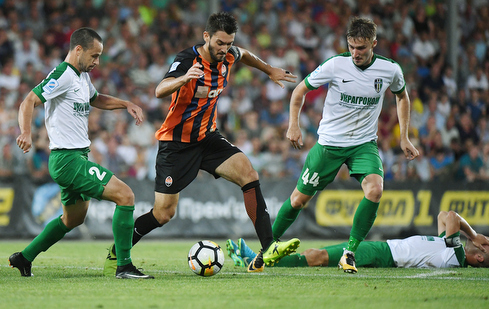 From then on, the Orange-and-Blacks launched set-play attacks, while counting on the defensive performance Oleksandriia tried to hit on counters. Shakhtar continued to maintain pressure on the opponent's goal. Marlos operated actively, demonstrating a threatening performance on his flank. However, the Townspeople were first to net an opener. After playing a corner on 38 minutes, Yevhen Banada hit a successful header to see the ball bouncing onto the crossbar and then inside the net. Nevertheless, Paulo Fonseca’s men pulled level rather quickly. Bernard played a set-piece, before his compatriot Fred was the first to get onto the rebound and sent the ball in a beautiful path into the top corner of the Oleksandriia goal to make it 1-1. 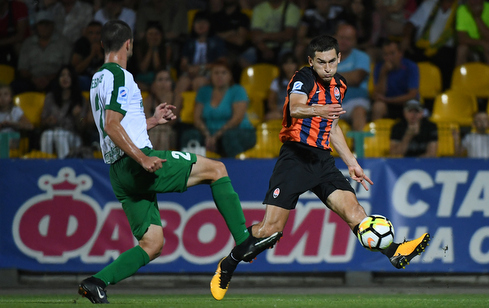 Inside the opening minutes, Ismaily could put the Miners in front: the left back fired a belter from ten meters, but Yuri Pankiv managed to revert the danger. Soon Facundo Ferreyra was obliged to score following a pass from Marlos, but the ball flew over the bar. A little later Taras Stepanenko succeeded in smacking a nice long-distance shot, but the post saved the Oleksandriia players. And still, the Orange-and-Blacks did the needful. As the clock ticked past the 60-minute mark, Bernarddisplayed personal skills and played a perfect well-placed pass to Facundo Ferreyra: the Argentine did not leave a chance to the opponents to slot his header home. Following a goal, the game calmed down a bit, Shakhtar controlled the ball as well as the course of the meeting. In the 76th minute, Paulo Fonseca made the first substitution, fielding Alan Patrick in place of Viktor Kovalenko. The Brazilian immediately found himself in the thick of a promising episode, but the opponents’ defenders interrupted his sharp pass into the penalty area. Oleksandriia had a chance to win, as Yevhen Banada’s header hit the post. Into 84 minutes of the game, Ivan Petriak emerged on the field to take the position of Marlos. Immediately after that, the Donetsk team delivered a threatening counterattack, but Fred's finishing pass to Ismaily turned out to be inaccurate. Already in the added time, Marcio Azevedo came on for Bernard to make his this season debut outing. The late stages of the second period passed in mutual fight, and the referee’s final whistle recorded a 2-1 win for Shakhtar. The Miners will hold their next match on August 19 in Kharkiv. As part of the 6th round, the Orange-and-Blacks are to face Olimpik. It gets under way at 19:30.